Cinnamon Sugar Apple Puff Pastry. Hello hello! I have the EASIEST dessert ever for you today! And it’s coated in cinnamon sugar. Um hi, can I please coat my entire life in cinnamon sugar? Please and thank you. When I was a kid, my grandma made the most wonderful cinnamon sugar toast and the cinnamon sugar was housed in this little shaker that looked like a bear or a boy or something. I’m pretty sure we have discussed this before in the blog comments, but I used to get ridiculously giddy over that shaker. I also used to think that cinnamon sugar was a special spice in itself. Didn’t realize it was sugar PLUS cinnamon, swirled together. I thought there was a special spiced sugar. The worst part is that I probably thought this was a legit thing until I was going to college. And couldn’t find cinnamon-flavored sugar. Cinnamon sugar toast still makes an appearance in this house, but it’s only when I’m desperately craving comfort food and I often use coconut oil so I feel better about consuming sugar-coated toast. Does it taste like heaven? Of course. Does Eddie think it’s ridiculous? Obvious. 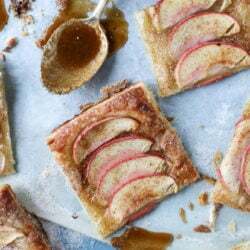 I wanted to mimic that feeling and flavor with the puff pastry and give the whole Thanksgiving apple pie a spin. This is SO super simple but still packed with flavor, so if you’re having a holiday party or cooking the entire Thanksgiving dinner by yourself, you can throw this together in a few minutes and have a delicious dessert. So here’s how this all goes down. Get some store-bought puff pastry! You can make your own if you have the patience of my mom or the time of forever on your hands. Brush it with egg wash and shower it with a cinnamon sugar rainfall. We are talking – a cinnamon sugar microburst. Lots of cinnamon sugar! 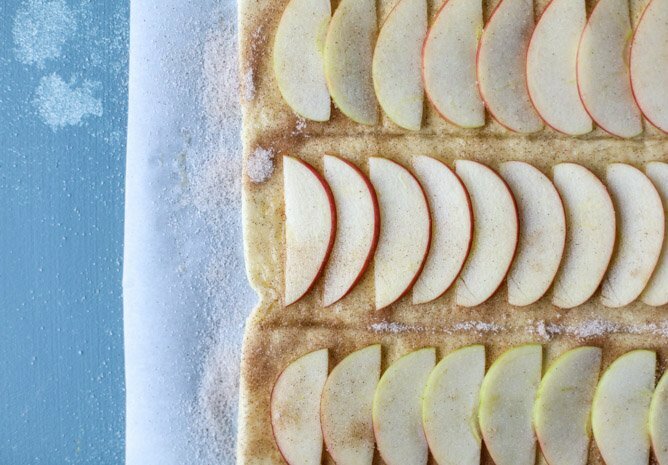 Throw some thinly slices apples on top and maybe, if you’re into it, dust them with cinnamon sugar too. It’s November! You’re allowed. Bake that baby. Until it’s puffed and golden and crisp with cinnamon sugar. It’s delicately crunchy on the outside, flakey and sweet and almost reminiscent of a perfect cronut. The middle tastes like apple pie, all cinnamony and slightly syrupy and wonderful. And I wouldn’t complain if you wanted to drench the entire thing in bourbon chai caramel. That’s a thing, really. Preheat the oven to 425 degrees F. Line a baking sheet with parchment paper. In a bowl, stir together the sugar, cinnamon and salt. Place the puff pastry on the parchment paper. Whisk together the egg and water and brush it all over the puff pastry. Sprinkling a few tablespoons of the cinnamon sugar all over the puff pastry. Place the apples on top, in whatever decoration you would like. 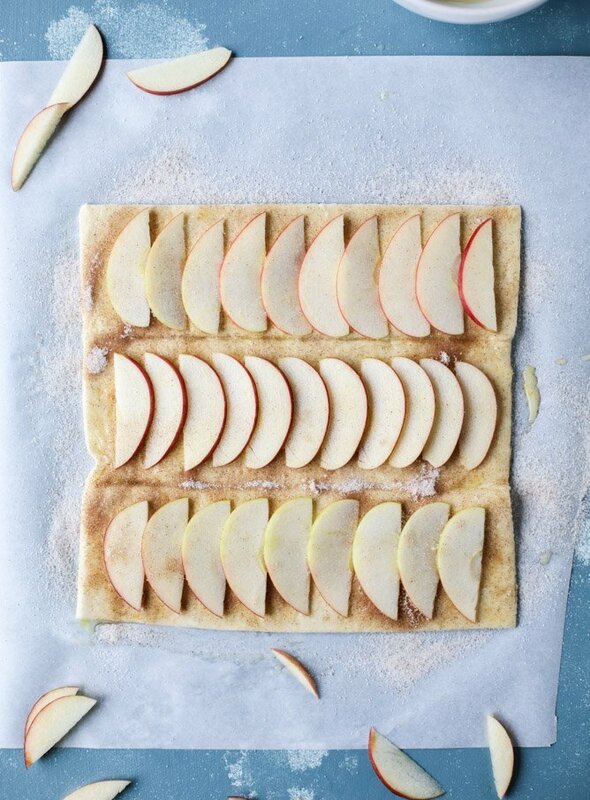 I used the cuts in the pastry as a guide to layer really thin apple slices. 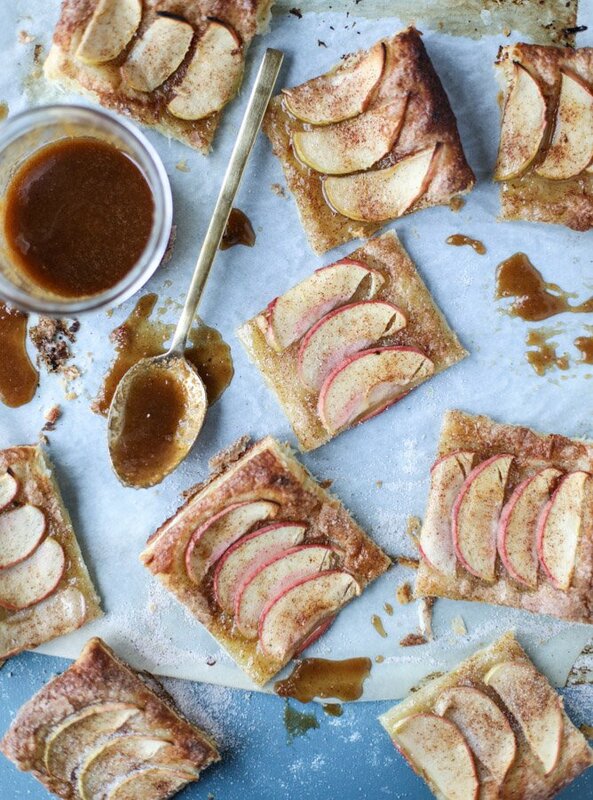 Sprinkle a little more of the cinnamon sugar over the apples. Bake the pastry for 25 minutes, or until golden and puffed. Remove it from the oven and cut into squares. Serve immediately. Serve with caramel sauce if you’d like! PEANUT BUTTER?! What are you, some kind of madwoman evil genius??! Madness, I tell you! Simple yet impressive T-Day dessert. Love this! I have 3 boxes of puff pastry in my freezer that I’ve got to use, and this is going to be the way to go. Definitely with bourbon chai caramel = OMG. Or what Katy said – peanut butter!!! Still all about the cinnamon toast in my house too – I can never stop. Grew up with my Gma making it for us, and I will never stop w/ it!! She always had a big shaker of cinnamon-sugar mixed up so that it was on hand. Such a brilliant woman. Haha. When I was little my grandma used to feed us cinnamon sugar toast-the cinnamon sugar came premixed in the container shaped like a bear and she used white wonder bread! It’s the least nutrious bread EVER which is why it tasted amazing! OCD vibes are feeling good with this one!!! it’s kinda giving me an open-faced, apple strudel feel, and toaster strudels were my JAM as a kid. Cinnamon and apples are the best this time of year! I can’t wait to give these puff pastries a try. All that cinnamon and sugar! Yes! This looks like a super easy dessert! Do you think I could make this a day ahead of time? Or is it best the day it’s made? I made this today, had everything on hand. Not only was it easy to make it was delicious. The caramel sauce just elevated it. Thank you for the quick desserts didn’t require a bunch of ingredients. Mine only took about 20 minutes. This looks like such a fantastic spin on a quick dessert! Cinnamon sugar was my JAM when I was a kid. I used to put it on everything I could. My favorite combo was putting cinnamon sugar on cheese pizza (the cheese pizza from costco was the best for this). It sounds super weird, but it’s delish. I still sprinkle cinnamon on cheese pizza, and TJs Toscano Cheese with Cinnamon is my favorite cheese ever, so I guess it’s a cinnamon and cheese thing. Grandmas make the BEST cinnamon sugar toast. And this is the perfect acceptable-to-serve-as-an-adult version. These remind me of those apple roses floating around the internet. This looks way easier, and just as beautiful. I’ve been making cinnamon sugar tortilla chips with coconut oil! Gluten free & coconut oil?! Totally healthy. I have a special little shaker just for my cinnamon sugar; it’s always been and always will be a part of my life. For a really sophisticated treat I love to make a pastry that has a brown sugar and cinnamon filling. By make I mean put it in the toaster oven. By sophisticated I’m kidding…it’s a Toaster Pastry!! I love the look of these; all things I love…thanks! up to I saw the paycheck which had said $8845 , I have faith that my friends brother woz like actualy erning money part-time on their apple labtop. . there aunt had bean doing this 4 only 7 months and resently took care of the morgage on there mini mansion and bought themselves a Lancia . view it now…. I want to turn back the clocks (years?) and demand someone make me cinnamon sugar toast. I had never even heard of it until my University roommate made it in undergrad (like whoa, how was that 12 years ago?). Seriously, mind blown. I currently live with a diabetic, so there isn’t extra sugar on anything in this house. Super sad. I do, however, have a container of cinnamon sugar (adulting ftw) in my baking box to roll cookies through before baking. I love how effortless this looks but with maximum beauty! A great dessert! Your pictures are amazing! Needless to say, the recipe is on spot as well. The magic of the sugar+Cinnamon powder makes a fairytale story that comes to life the moment we had our very first bite.